The D.C.-based Workingman Collective was founded in 2005 and centers on the wide-ranging activities of members Janis Goodman, Tom Ashcraft and Peter Winant. In their words, the collective privileges strategies of “process, invention, chance and the public,” and they aim to create scenarios that encourage collaborative—and ideally constructive—effort. In the past their efforts have included neighborhood interventions around D.C., such as building a mobile community center and working with the National Zoo to create a series of urban birdhouses. “Prospects and Provisions,” their recent show at Hemphill, marked the collective’s first solo foray into a gallery setting. If one felt the collective’s intentions to be sarcastic (which I don’t), Contract could be read as a dig at collectors who pay professional artists to realize—and in turn legitimize—their own creative ambitions. However sincere its intentions, Contract’s impression is that of artists scrambling to bottle (and sell) the principle of collectivity itself. 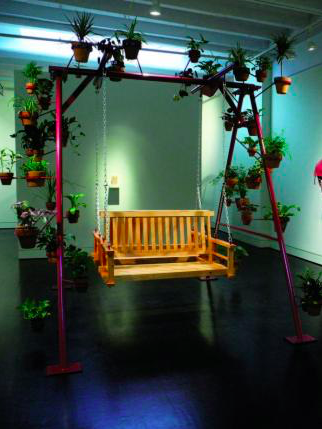 Stronger work emerges when the invitation to participate is examined rather than enacted, as in Champion, a video installation consisting of half a Ping-Pong table sprouting various potted plants and abutted by a 32-inch television monitor. The piece creates an unexpected sense of tension as the viewer, standing behind the table and facing the monitor, “plays” a bespectacled male competitor who lobs return shots on-screen. For all its pluck and polish, “Prospects and Provisions” failed to emphasize any meaningful statement beyond that which is broadly invoked in the mission of the collective itself. Still, in a city where the word “bipartisan” increasingly masks an obdurate, self-righteous refusal to bargain, it’s hard not to give credit to any serious invitation to sit down at the table.